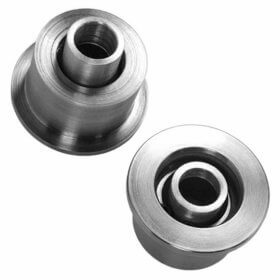 Track Stabilizing Rod Bushing Set Steel, Front – Spherical Bearings for BMW 2002. The stock front stabilizing rod bushings deflect, allowing movement in the front suspension. Upgrading your stock rubber track stabilizing rod bushings to our steel spherical bearing bushings will eliminate this movement for a much tighter front end. Made of stainless steel and precision CNC’d for a perfect fit. The CNC’d spacers allow proper rotation of the high-quality, Teflon-lined race-spec bearings when installed. Set of two. Engineered for a perfect fit.